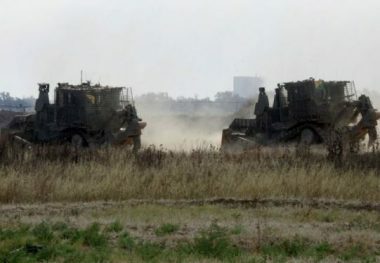 Several armored Israeli military vehicles, including bulldozers, invaded on Wednesday morning Palestinian lands, east of the al-Boreij refugee camp, in central Gaza. The soldiers advanced dozens of meters into the Palestinian lands, heading toward the Great Return March encampment, east al-Boreij, and started bulldozing them. The soldiers also started the installation of a new fence on Palestinian lands near the Great Return March tents, to prevent the Palestinians from marching towards main parameter barbed-wire fence. The Israeli army conducts ongoing invasions into Palestinians lands agricultural lands near the fence area, and frequently open fire at farmers, and workers, in addition to constantly targeting fishermen in Gaza territorial water. Although this invasion apparently aimed at installing the barb-wire fence, the army has been invading Palestinian lands, bulldozing and uprooting them for many years, to enforce its imposed “buffer zone,” where the Palestinians are not even allowed to approach although the zone was set deep inside their lands.